Tailgaters take heart: The Vikings have your back. In an effort to address the rapidly dwindling number of tailgating spots surrounding their new stadium, the team will ask city officials to consider expanding the downtown tailgating zone. They also will discuss allowing private lot owners to open up to tailgaters. The request, expected today at a meeting of the city's Stadium Implementation Committee, is in response to growing concerns among some season ticket holders that a $400 million office, retail and housing development planned for five downtown blocks near the new stadium will gobble up prime tailgating spots in three surface parking lots. Team officials decided to make the recommendation after surveying more than 21,000 single-game or season-ticket holders earlier this spring. Nearly two thirds of the roughly 3,000 ticket holders responding said it was "very important" to be able to tailgate at the new stadium. But more than half said they would prefer not to park or tailgate at lots far away and use a shuttle service to get to and from the stadium. Nearly three out of four ticket holders said they might consider sharing tailgating space at a park or plaza nearby. "It's a hot button issue with our fans," said Lester Bagley, a Vikings vice president. For many, he added, "it's about being in the vicinity of the stadium, to put down their beverage and walk to the game so they can pull into their seat when the game is about to tee off." The $400 million development by Ryan Cos. calls for acquiring five blocks owned by the Star Tribune, three of which now provide more than 800 parking spots for potential tailgaters. 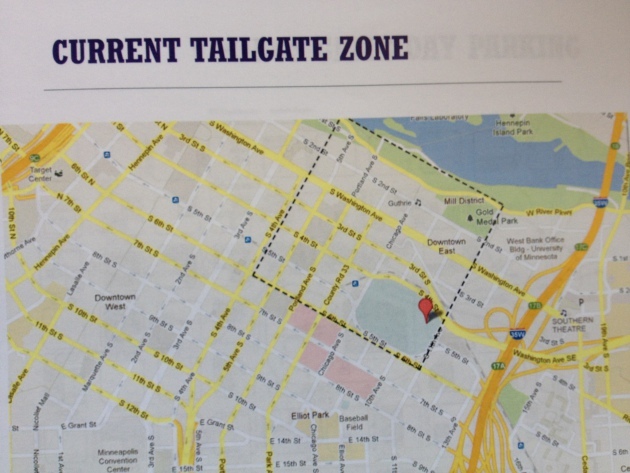 Chuck Lutz, a city development official, said the city plans to meet with the Vikings next week to explore additional tailgating options downtown. The team’s tailgating tradition took a big hit in the early 1980s after the team moved from Metropolitan Stadium in Bloomington, which offered thousands of surface parking spaces.